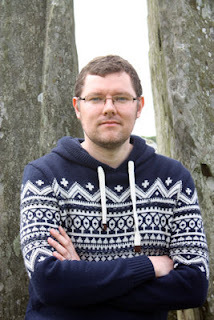 Please welcome Cameron Johnston to The Qwillery, as part of the 2018 Debut Author Challenge Interviews. 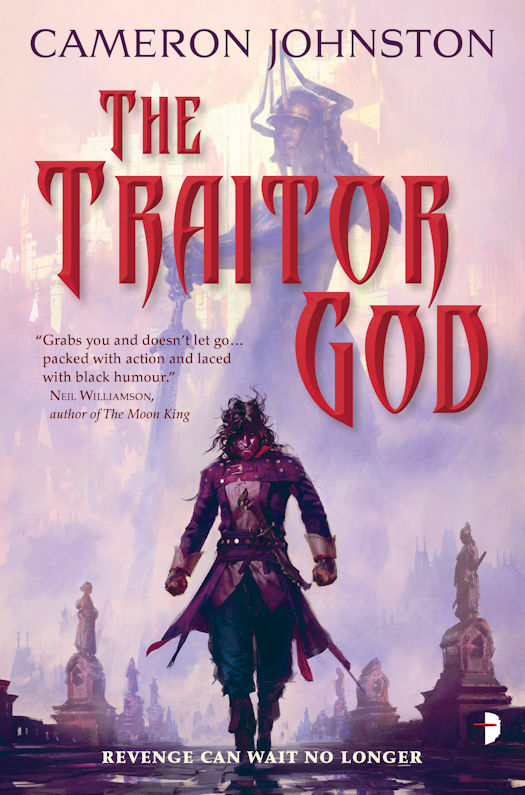 The Traitor God was published on June 5th by Angry Robot. Cameron: I have vague recollections of writing Transformers fan-fiction as kid back in the 80s. I suspect Grimlock was the hero of the piece. How can you not love a T-Rex transformer?? Oh, wait, I've seen a film called Age of Extinction...never mind. Cameron: A pantser! I find if I try and write detailed plot outlines that it kills the joy of writing for me and the characters rebel. Instead I only have a bare scaffold of beginning, end, and a few important points that I want to hit along the journey. Cameron: Making the time to do it all. When you have books, TV/films, RPGs to play, swords to practice with, and a lovely wife to spend time with, it can be so easy to put writing off to another day. As for the writing itself, sometimes a plot is supposed to head to Y, but the character you have developed goes "Nope!" and wants to go to Z instead. It can be tricky to resolve those issues. Cameron: Too many media influences to list them all really. Old films like Night of the Demon and Quatermass and The Pit, pulp fantasy stories like Conan and Elric, the cosmic horror of HP Lovecraft, and comics like 2000AD and Hellblazer. I'm also heavily influenced by history, archaeology and mythology, with a great love of castles and other ancient sites. TQ: Describe The Traitor God in 140 characters or less. -Hellblazer’s John Constantine meets swords & sorcery in a tale of revenge and Lovecraftian horror. -Malazan meets grimdark urban fantasy. TQ: Tell us something about The Traitor God that is not found in the book description. Cameron: It's not all relentlessly grim and dark. There is hope, bad jokes and black humour, and also decent people trying to do the right thing in horrendous situations. TQ: What inspired you to write The Traitor God? What appeals to you about writing grimdark? Cameron: I used to strictly write 3rd person limited point of view, and as an experiment I tried 1st person PoV in a film-noir styled swords and sorcery short story - and it sucked me into this unexpectedly dark and dangerous world and demanded expanding into a whole novel. As for writing grimdark, it allows me to explore what characters do when everything has gone to hell - how do they keep going in the face of death and devastation? And how do they survive without becoming monsters themselves? TQ: What sort of research did you do for The Traitor God? TQ: Please tell us about the cover for The Traitor God. TQ: In The Traitor God who was the easiest character to write and why? The hardest and why? TQ: Why have you chosen to include or not chosen to include social issues in The Traitor God? Cameron: Walker was a gutter rat in Docklands before his magical Gift was discovered and he was plucked from poverty to become an initiate with the Arcanum that rules the city. With that, he straddles the lines between the rich and powerful and the destitute and desperate he still self-identifies with. It would be impossible not to delve into that social divide in some way. TQ: Which question about The Traitor God do you wish someone would ask? Ask it and answer it! Q: Did you purposely set out to create a high-magic setting? A: Definitely! Things like A Song of Ice and Fire with its vague, looming magical threat and hints of magic was something that I wanted to get away from. I wanted it more like old pulp fantasy worlds of Conan and Elric. Big magic, dark gods and demons, magical weapons and horrific monsters. TQ: Give us one or two of your favorite non-spoilery quotes from The Traitor God. "This town was already doomed and I wasn’t going down with it. Heroism could get a man killed." "A daemon glitters in the moonlight, crystalline, many-eyed, scuttling towards him down the alley like a spider made of knives, its limbs all straight lines and jagged cutting edges." TQ: If you could build one structure from The Traitor God in LEGOs, which one would it be and why? Cameron: Oh dear. You have happened upon a hobby of mine. How can I possibly only build one thing out of LEGO? At a push I would go for a cityscape scene, with giant brick monsters fighting. Cameron: A second novel in the series, The God of Broken Things, is coming next June, so watch this space. Cameron: Thank you for having me. It has been a pleasure. Gotta love those characters that have a mind of their own! Amazing cover, great plot. Glad this book was highlighted!